Blog home > Conservation > Rewilding: Is it time? Mention the ‘R’ word in some circles and hackles rise. Visions of out-of-control wolves on a killing spree spring to mind and primeval fears mixed with deep-seated cultural resentment of change, bubble to the surface. Politics too, is inextricably linked to the potential, or otherwise, for rewilding. Rewilding is a relatively new word. It has different meanings for different people, but in essence refers to the restoration of natural processes; allowing Nature to go about its business unimpeded. For many advocates it also embraces the need to return absent species that in the past helped those natural processes sustain the land (and sea). In the UK, such species would include wild boar, beaver, lynx, wolf and even bear. George Monbiot’s recent book Feral, has brought the rewilding pot back to the boil. Across mainland Europe there is a significant wildlife comeback: wild boar, chamois, bison and a whole suite of raptors and large carnivores are either finding their own way back, relieved of centuries of persecution, or are being deliberately reintroduced to help restore functioning ecosystems. But here, in a country where there are more ‘conservationists’ than almost anywhere in the world, reintroductions and rewilding in general, remain nauseatingly political and tortuously bureaucratic. Don’t get me wrong, lots of good stuff is happening in the conservation sector – I’ve seen that for myself throughout the 2020VISION project – but in comparison to other countries, even countries with far less resource than ours, our efforts are conservative and frankly, embarrassing. Wild boar are forest engineers, exposing the ground to fresh seed. Much of the UK used to be cloaked in natural woodland, almost all of it now gone. So why should we rewild? For me there are 3 primary reasons. Because it’s the right thing to do. We rid ourselves of wild nature – something we now condemn in developing countries – and it’s our moral duty to put that right. Other countries are doing so and so should we. Because without fully functioning ecosystems, our world is running on an engine without oil. Sure we can get away with it for now, but in the long term, that engine will need serious repair or worse, will stop. We all rely on clean air, fresh water, pollination…the list goes on. Unless we allow natural processes to flourish, these and other ‘ecosystem services’ will come under threat. Because we need wildness in our lives; it’s where we came from; it’s our natural home. Increasingly science is linking a detachment from nature with conditions such as depression, obesity and in children, attention deficit disorder. A robust Natural World is not a conservation issue; it’s a societal requirement. Opponents contest that our small country is too over-crowded for rewilding; too much water has flowed under the bridge to go back; rewilding is nothing more than a fanciful romantic notion. For me it’s not about going back, it’s very much about going forward with a more ambitious vision: it’s also about letting go and here is where I think we struggle. I’m a pragmatist and I understand the socio-economic and cultural persuasions against rewilding. But in the long term it’s not only desirable for those of us with that fanciful romantic notion, it’s absolutely necessary for the future well being of our own species. It’s about doing what’s right for us and for those species we live with. …with this likely to become a more common sight. Damage or just ecological change? I’m not suggesting that wolves are released tomorrow: this is not about wolves, despite what the media predictably focus on. I’m suggesting that if you believe that a vibrant, intact Nature with all the ‘services’ that it provides, is good for us in the longer term, we need to persuade other people of that. In my view, conservation (hanging onto to the meagre threads of a battered landscape) has had its day: the time is right for Rewilding. I couldn’t agree more with your overall sentiment Pete, although on here I suspect you will be pretty much preaching to the converted, or perhaps mostly converted. Unfortunately despite the successes of projects such as the beaver trail, with the exception of a few organisations I am becoming more and more disillusioned by what passes for conservation nowadays. The problem is a lot of people appear detached by our natural world, not because they don’t care at all, but out of apathy because they are struggling to survive both spiritually and physically day-to-day. Our whole society is based upon consumerism and increasingly that includes organisations we entrust to look after the interests of wildlife. I have lost count of the number of visitor centres, cafes etc that seem to be appearing. Adding in my opinion to the urbanisation of our countryside and treating it more as a theme park. I realise that such organisations cost money to run, but how on earth do you interest poorer people from say towns and cities to value and spend time in our natural world in places like the Lake District when it can cost £7.00 a day just to park in car parks run by the National Park and the National Trust. This charging for access is spreading like wildfire and harming both local economies and preventing people on lower incomes from regular visits. The idea of rewilding seems to be a vision for the well off and I can already hear organisations working out how they can spend millions building a visitor centre, shop, cafe, toilets and car park ready for when the Lynx is reintroduced. Nature actually needs very little help other than space to thrive, yet seems to be overcomplicated by career conservationists determined to pander to the theme park model. If we as a society can get beyond nature as being of value to look at and profit from, we may stand a chance of something long lasting, otherwise any genuine rewilding of top predators will last about as long as the funding holds out and people can profit from it. brilliant brilliant, could not agree more, me and my business are dedicated to making this happen. I am totally with you Peter but it is a hard question. In my native Sweden we have a relatively large beaver population for example and most forrest land owners see them as a pest that ruins their livelihood. I am too ignorant in the ecological impact of beavers to argue against them but at a first glance I can understand their point of view. In essence it is the same discussion as the African bushmeat discussion. They kill the animals to sell the meat to survive. Some landowners in our “civilised” world poison the beavers to be able to sell the tress for “survival”. Where is the real difference? As I said, I am totally with you but it is important to recognise that it is a very hard and delicate question. I have taken the beaver as an example. With the same example, how can we convince the forrest owners to let the beavers “destroy” their trees? What arguments do we use to be convincing? Good to hear from you and sorry I didn’t get more chance to speak at Wildphotos. These are indeed difficult issues and with the barometer for our society’s ‘success’ almost entirely founded upon economic growth, the questions become even more difficult to answer. Personally I think that justifying the existence (or reintroduction) of a given species purely on financial grounds, isn’t the way forward. Arguing that tourism dollars should keep a lion alive when it’s just killed your cattle is shaky ground in my view. So, we have to look to a more fundamental shift in our value system – social, cultural and economic. That doesn’t happen quickly but there are signs that it is happening. Thanks Pete, what you say takes me back to Tooth and Claw days. I was at WILD10, the World Wild Congress, Salamanca, Spain early October to keep up with interesting developments in Europe. George’s speech was a highlight for many folk. But I came back with a lasting regret. The Congress is well attended by indigenous and tribal peoples representatives who spent several days sharing tales of indigenous and communal projects as well as often despairing over what is happening to their lands. No surprises there. But although in the same place, I did not see commitment to the idea that there would be much to learn by bringing together the experience and learning of these people with our own experts and decision makers for conservation and land management. I wont say ‘Worlds apart’, but not together enough. I have been reading the discussion on rewilding with interest and thought I would add a few comments. I know that Pete is a passionate advocate for rewilding and his arguments for it, are, for me, quite right and totally justified. I agree particularly with his response to Johan’s comments – that that a fundamental shift is needed in many areas of our society, particularly where are values lie. I think that this shift is needed at all levels of society – from those who are in a position to make policy to those who are trying to make a living off the land. The process of attempting to rewild landscapes is slow in the UK, as has been pointed out but steps are being taken, as Pete and his colleagues demonstrated in their excellent 2020 Vision book. Conservation is taking place at the landscape level and there examples of such projects can be seen in wetlands, manage realignment along the coast, rivers, forests etc. There are several factors which hinder attempts at rewilding in the UK, which may not be such prominent issues in other European countries. One of these is the issue of land ownership. I am a great fan of the work that Boris and his chums (Pete’s highland cattle) are doing but Pete is in the happy position of owning the land and can choose to do this. He is also in an area where many organisations are working together to rebuild the Caledonian forest and bit by bit, real change is being achieved. 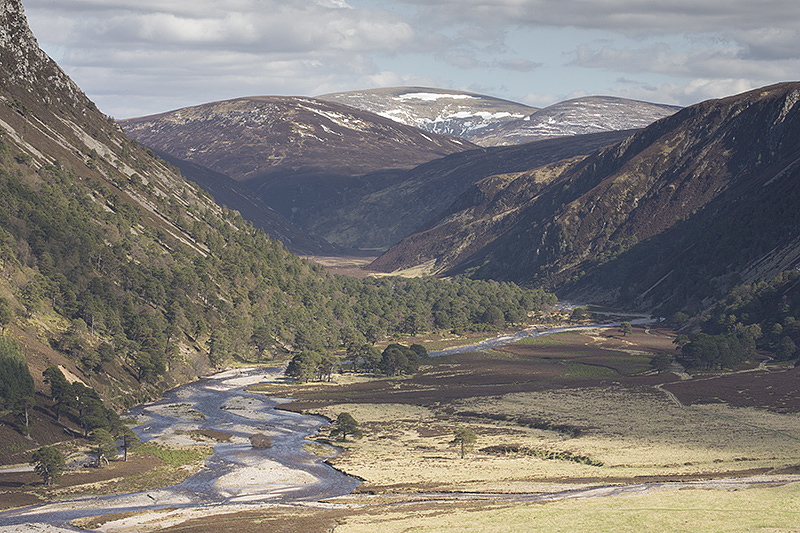 So much of the land in the UK is privately owned and, particularly in the uplands, managed intensively for sporting interests, that any conservation measures must be achieved with land owner agreement, which makes for slow progress, particularly when livelihoods are involved as Johan pointed out. Our idea of what constitutes a beautiful landscape has been much influenced by the way land has been managed. Management for grouse moors, with it burning and drainage regime and also grazing by deer and sheep, have led to distinctive landscapes in the UK’s mountainous areas. Yet to many people, this is a beautiful landscape, as visitors to the Lake District commented earlier this year – it is what they expect to see. Earlier this year I went to Bulgaria, with my husband, on a bird photography trip. Bulgaria is blessed with glorious biodiversity, whilst many of its citizens live in poverty; it is one of the poorest countries in Europe. I have to admit that when we travelled through the mountains, it took me a few moments to realise what was so unfamiliar about the landscape; we are not used to seeing mountains cloaked in forests, as many of our mountains would naturally be. The fact that the UK is an island also hinders the spread of reintroduced species or those that are recolonising former ranges, like beavers, wolves etc in Europe. However while that fact that such species are spreading in Europe this brings with it problems, as Johan pointed out. I myself have signed up to volunteer for a project led by an organisation called ‘Earthwatch’. The project is situated on the Dutch-German border and looks at beavers which are now spreading from their reintroduction sites in Holland, along the lower Rhine and into Germany. The project will investigate their impact on species and habitats and also on people. I signed up for this because I am very fond of beavers but also because I am very interested in how reintroduced species impact upon a landscape which is very different to that which was present when they formerly occupied that area, and also how they interact with people. Personally, I am very enthusiastic about rewilding but being realistic, progress in the UK is likely to be slow with any gains made very gradually, by organisations, landowners and others working together. Like some of the others writing here I share the frustration at the slow progress of rewilding initiatives in the UK but dedicated people and organisations are making it happen and need all our support. Whisper it softly but I work in conservation.